Walker, Mary Jean 2018. Two senses of narrative unification. Philosophical Explorations, p. 1. Walker, Mary Jean and Rogers, Wendy A. 2017. Diagnosis, narrative identity, and asymptomatic disease. Theoretical Medicine and Bioethics, Vol. 38, Issue. 4, p. 307. Keane, Webb 2014. Affordances and reflexivity in ethical life: An ethnographic stance. Anthropological Theory, Vol. 14, Issue. 1, p. 3. Perry, John 2010. 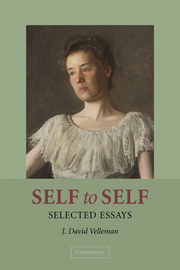 Critical Study Velleman: Self to Self . Noûs, Vol. 44, Issue. 4, p. 740. Fisher, Tony 2010. Heidegger and the narrativity debate. Continental Philosophy Review, Vol. 43, Issue. 2, p. 241. MACKENZIE, CATRIONA and POLTERA, JACQUI 2010. Narrative Integration, Fragmented Selves, and Autonomy. Hypatia, Vol. 25, Issue. 1, p. 31. Manders-Huits, Noëmi 2010. Practical versus moral identities in identity management. Ethics and Information Technology, Vol. 12, Issue. 1, p. 43. Madden, Rory 2010. Could a Brain in a Vat Self-Refer?. European Journal of Philosophy, p. no. Doris, John M. 2009. SKEPTICISM ABOUT PERSONS1. Philosophical Issues, Vol. 19, Issue. 1, p. 57. CUMMISKEY, DAVID 2008. Dignity, Contractualism and Consequentialism. Utilitas, Vol. 20, Issue. 04, p. 383. Roy, Olivier 2008. Intentions rationnelles et acceptations en délibération. Philosophiques, Vol. 35, Issue. 2, p. 525.